The Otay Water District has enlisted drones to modernize the service that it provides to its customers. The District’s use of drone technology is a reflection of its continued process improvement philosophy to conduct efficient maintenance operations, improve the safety of its workers, and ultimately deliver greater value to its customers. 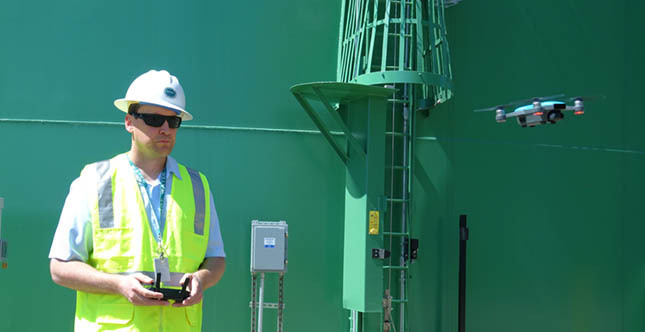 After a two-year study and evaluation period, the District is now using drones to assist with preliminary inspection of water facility assets including 40 potable water reservoirs, four recycled water reservoirs, 20 pump stations and a recycled water treatment plant. Drone technology can provide time savings with initial inspections and a safer examination process of the District’s assets. Initial inspection of water tanks by drones, for example, may reduce the need for water operators to access tanks and therefore, minimize the risk of potential injuries. Utilizing drones for general surveying and inspection of the District’s assets also will help to maximize personnel productivity, as the District’s service footprint is expected to grow over the next six years. The District’s contractors are also using drones to monitor the construction of the 36-million-gallon expansion of the Roll Reservoir. Images and information from contractor drones are used in quarterly presentation reports to the District’s Board of Directors. Operated by two trained employees, the District’s drone program complies with the Federal Aviation Administration’s Part 107 regulations, for a small unmanned aircraft.